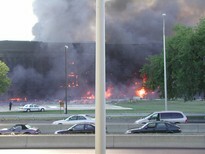 I took these pictures less then 1 minutes after I watched the american airlines 757 airplane crash into the pentagon on september 11 2001. I left shortly after the picture were taken in fear of further attacks. Feel free to contact me anytime if you have questions about my pictures. I did acctually see the plane impact the building. These two photographs were taken by Steve Riskus within minutes after American Airlines #77 hit the side of the Pentagon. The photos show widespread fires as a result of burning jet fuel, described by smell, sight and burn injuries, which were diagnosed by doctors at nearby hospitals. The source for the following is at: http://www.humanunderground.com/11september/s11-media/et7.jpg. It is linked to from "Independent Flight 77 - Pentagon Event Investigation; Evidence and Witness - Part 2: The Pentagon Event" by Agent Fescado and contains excerpts of an interview with Steve Riskus. 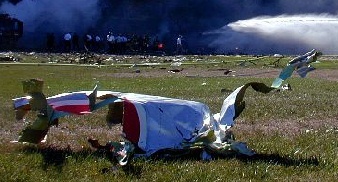 It displays a photo of the famous plane part on the lawn, and Steve's account of the crash. Finally an eye-witness contacted humanunderground to settle the matter. . . .
is on the writing as pictured below. Detail from: "Wreckage of flight 77 on Pentagon lawn," NavyNewsStand - Eye on the Fleet / www.news.navy.mil, 010911-N-6157F-001 Arlington, Va. (Sep. 11, 2001), U.S. Navy Photo by Journalist 1st Class Mark D. Faram. "I am sorry to rain on your parade, but I saw the plane hit the building. It did not hit the ground first... It did not hit the roof first... It hit dead center on the edge... I was close enough (about 100 feet or so) that I could see the "American Airlines" logo on the tail as it headed towards the building... It was not completely level, but it was not going straight down, kind of like it was landing with no gear down... It knocked over a few light poles on its way... I did not see any smoke or debris coming from the plane. I clearly saw the "AA" logo with the eagle in the middle... I don't really remember the engine configuration, but it did have those turbine engines on the wing... and yes, it did impact the Pentagon... There was none of this hitting-the-ground first crap I keep hearing... It was definitely an American Airlines jet... There is no doubt about that... When I got to work I checked it out." 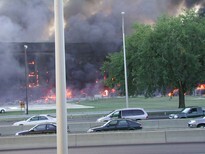 Photograph of Pentagon with the roof caved in. 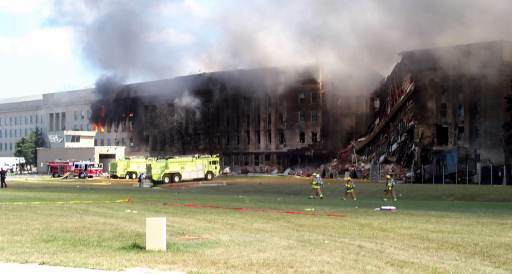 The evidence of burns on the Pentagon walls are in the pattern of a plane crashing the walls and the burning fuel having splattered all over them.